Creating My First Comic Book – Part 5: The Wilds of Self-Publishing – AiPT! Hi, my name is Cameron and I’m the writer and co-creator of Skeleton Bay Detective Agency, a comic that I self-publish with the artist, Taylor Carlise. If you’re just tuning in, welcome! This is the time of the week where I go on and on, sharing the wisdom I’ve gained in all my many years of comic book creating history, despite the fact that this is my first-ever comic and have only really been at this for a year or two now. In fact, we recently passed the one-year anniversary of our first Kickstarter, a big milestone for us and something I’ll get to in a minute. Way back in the third part of this series, I talked about our first real, substantive step toward making the comic: the pitch packet. We had hoped that it was our key to getting our book out in the world, but after sending it to six or seven publishers throughout 2015 and 2016, reality was making itself clearer and clearer that we were going to have to take matters into our own hands. Meanwhile, Brittany Peer (the colorist for the book), Taylor and I had started talking about Heroes Con in Charlotte, North Carolina. Both Brittany and Taylor had been before and I knew that it had a great reputation as a convention to go to if you’re a creator. It didn’t take long for us all to agree that we should go down and table. I talked about this year’s experience at Heroes Con in the fourth part of this series, but looking toward our first show, we were not nearly as prepared as we needed to be. Now, if the writer, artist, and colorist of a comic book were all going to be at a convention together, it stands to reason that we should have something from that book, right? At the top of 2016, though, we only had the first five and last five pages of our first issue done; not quite a comic yet. Besides, the main series was still in “maybe they’ll buy our idea” limbo, so we didn’t want to show off our shiny new #1… then not publish #2 for five years while we’re inking our Sweet Dealz with Image Comics. Instead, we focused on getting the 12-page, self-contained story “Midnight at McLloyd Mansion” printed. That way, we could establish the tone of the series and show off some of the characters, but still leave readers with a satisfyingly conclusive book. A friend of mine immediately pointed out that Kickstarter exists. So, we embarked on our first Kickstarter; if we were going to crowdfund, we might as well get some practice in on the biggest crowdfunding platform there is. We crunched some numbers that included the cost of printing a batch for Heroes, a batch for our Kickstarter backers, a batch for ourselves for future endeavors, the cost of the posters we were providing as a reward, and the cost of shipping. Some estimates were hard numbers, but most of them were not, so I developed an increasingly elaborate Excel sheet that I’m still pretty proud of. We eyeballed and guestimated things like shipping and number of units, then rounded up to get $500. In the larger universe of Kickstarter, it was small potatoes, but the $1,500 we raised tripled our goal and we were ecstatic. We made enough to cover all the costs of our original plans and were even able to hire Brittany for the colors (who had since been hired for professional colorist work and needed to be paid to be able to spend time on our project) which resulted in a really excellent-looking book that we’re all very proud of. If you handle the finances, either have a separate account to store the money, or be REALLY clear about your expenses/costs/how much money you have left. There was no mismanagement on our project as far as I can tell, but as the post-project months drag on, it’s really easy for the lines between “your money” and “the project’s money” to blur if it’s all in one pile. If you’re doing fulfillment yourself, don’t underestimate how big a pain it is. It took me and a friend like 3 or so hours straight to just prep packaging, which is to say it took SIX STRAIGHT HOURS, NON-STOP JUST TO CHOP UP CARDBOARD. So. Keep that in mind. Don’t do 11×17 posters. It’s about $20 for 500 9×12 envelopes, but $500 for twenty 11x17s. I don’t get it, I was trying to do universal dimensions, and apparently 11×17 is not one of them. Between running the Kickstarter, going to Heroes Con, getting McLloyd Mansion printed and sent out to our backers, we had kept ourselves busy through a lot of 2016. By the end of the summer, though, we had reached the edges of the wide net we had cast with our pitch packet and were at a bit of a crossroads. There were a handful of different avenues to explore: do the convention circuit and hawk our books in person; just keep running Kickstarters each time we have a new issue; maybe just stalk the editors of our favorite publishers until they finally said yes to us. Ultimately, we decided to go with the less financial-heavy, much more legal choice of publishing Skeleton Bay as a webcomic. 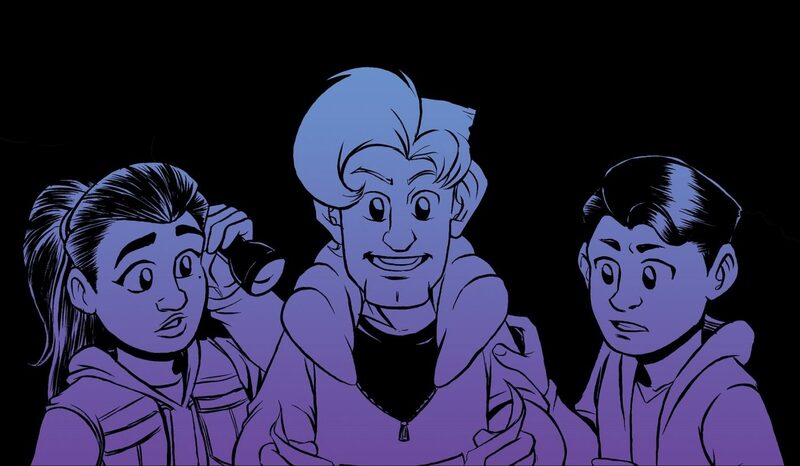 While there is a lot that we’re excited to explore artistically with the series, from a business side, the series has always been about us learning new skills and honing our craft rather than strictly making money (insert my mom sighing about how she wishes it could be both) so we decided to learn the new skill of publishing a free webcomic! I did some research about which platforms and templates other webcomics have used and settled on a Tumblr-backed site. While I have some mumbles and grumbles about the layout, I’ve generally been pretty pleased with Tumblr. We launched on Halloween (because of course) and have been able to put out a page a week every Monday. Turns out, though, spending two years toiling away to create a comic book is actually the easy part. Getting anyone to care about us is a whoooole ‘nother mountain to climb. There are a LOT of things competing with people’s attention, a lot of reasons not to listen, and a lot of good intentions not followed through. I don’t blame anyone, I know I certainly am vulnerable to nodding along with a friend, promising them that I’ll definitely take a look at their project, but never actually following up (something I’ve been a little more mindful of now that I’m the one telling them to look at my project). It does mean, however, that it’s a constant battle for people’s time and has practically become a part-time job to promote the comic. And that’s where I’ve found myself now. As Taylor diligently hammers out pages week after week, I’ve been trying to figure out what alchemic combination of Facebook posts and email blasts will get people to pay attention to us. So far, we’re doing OK. We have a Facebook, where we post every week about the page, a newsletter that I’ve recently had to start learning Mailchimp to utilize, and a Patreon that has some (I think) really great behind-the-scenes content (In fact, it’s a lot like a weekly version of these essays, so if you like this “how the sausage is made” content, please consider contributing). But as it turns out, despite being similar to Kickstarter, Patreon is a bigger ask on a less-known platform, so it’s harder to attract people. Facebook is an easy way to potentially reach lots of people, but we’re struggling to get our posts seen at all, let alone by anyone other than our current subscribers. The first newsletter was well received, but it has its own pros and cons. It’s been a lot of guess and check, try this out, try that kind work, all while trying to remember that we haven’t been at the website for even a full year, so I have to be patient as we grow our tribe. And that takes us up to today, so this is where I finish this five-part plug for my comic (I told you way back in the first part that this was a shameless plug). I hope my journey so far has been inspiring and not too discouraging. It really is a literal dream come true to have come up with an idea in my head and see it exists there on the page. So each and every time I’m able to work on Skeleton Bay is a new lesson learned. Each new cover letter I write, I get better at writing them. Each new Patreon post I post, I get more comfortable chatting about the process. With every step forward into the industry I take, the more and more confident I become that I’m capable of making a living, a career, a life, out of the art form that I love. That’s it for this particular series of essays. Thank you, AiPT for giving me a platform, and thank you for reading. If you want more, let me know in the comment section, but otherwise, be cool and stay spooky (it’s the sign-off I use for Skeleton Bay things).